My name is Paula Coughlin. I am a former US Navy Lieutenant, helicopter pilot and military sexual assault survivor. Using the form at the right, stand with me and send a message to your Senators now! 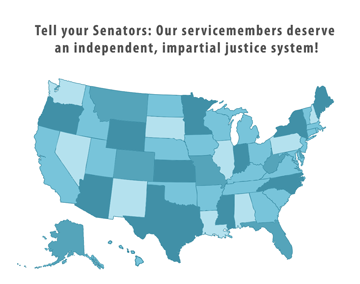 Tell them why supporting the Military Justice Improvement Act (MJIA) is important to you. Protect Our Defenders will deliver it for you. I was sexually assaulted over 20 years ago while serving my country, in what is known as the Tailhook scandal. I went public with my assault when I learned that instead of punishing the perpetrators, the chain of command was sweeping the scandal under the rug. For airing the crime, I was persecuted and eventually lost my job in the Navy. And sadly, nothing has changed in the two decades since. We know from the Pentagon’s own data and victims coming forward that the retaliation continues to this very day. In the Senate, the only proposed reform that could prevent future cases like mine is the Military Justice Improvement Act (MJIA). I wholeheartedly endorse this bill, which would give the decision of whether to send a case to court-martial to trained, independent military lawyers, instead of often biased and conflicted commanders. This is a substantive change that will help bring justice for victims, revive trust in the system, and lead to more perpetrators behind bars. If MJIA had been in place when I was assaulted, I believe I would have been able to continue serving my country. I am still waiting for our Senate leadership to do the right thing. Survivors of this crisis have waited long enough. But the military has failed time and again to end these crimes on its own. All the survivors and their families who I know want this amendment to be enacted so that the military is a safer place for our sisters, brothers, sons and daughters. Support is building, but there are still senators that are undecided. We need to send them a clear message before the upcoming vote that survivors are counting on them. Please tell our leaders that survivors’ voices can no longer be ignored: Move the decision to prosecute sexual assault cases from a commander with no legal training to independent, trained military lawyers. Stand with Paula. Alert your Senator by filling out the form above.